Top seed Camille Serme claimed her first Cleveland Classic title as she came from a game down to beat Alison Waters in the final in Ohio. 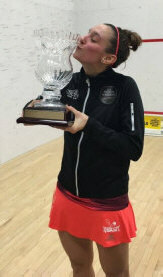 "So happy with this victory! It was a great match against Alison Waters in the final: hard battle but good athmosphere. It was very tactical and im glad i managed to stay in this battle to win 3/1 at the end. "Thank you so much to everyone for the support! My coach, my family and some friends stayed up late to watch it from France so Thank you! Thank you to all my sponsors. Thank you to the great Lennon's family for everything they've done this week to make me feel like home! "See you next year Cleveland!" Top seeds Camille Serme and Alison Waters will contest the final in Clevland after contrasting semi-final wins. 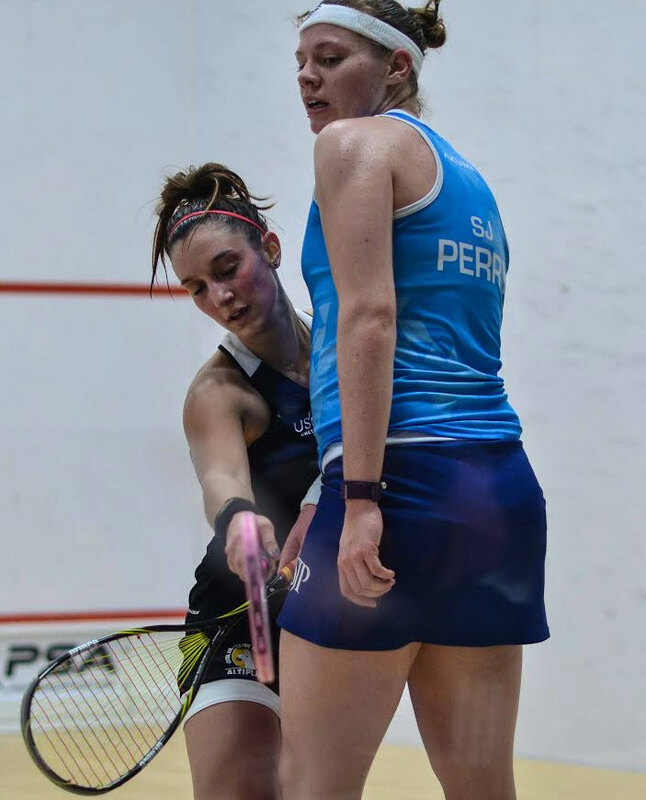 Serme got past Sarah-Jane Perry in straight games, although the English fifth seed pushed Serme close in the second game. "I try to focus on every ball in every point," said Serme. "Sarah is such a nightmare to play because she is so talented and hits the ball well. It was a good tough battle." 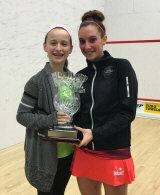 Waters won a see-saw five-setter against US number one Amanda Sobhy, who led twice before Waters took the final two games to move into the final. "I had to get deeper length, that was the key," said Waters. "I lost my discipline and Amanda can hit nick from anywhere as you saw." Amanda Sobhy is the last remaining American in the draw after the semi-finals in Ohio. 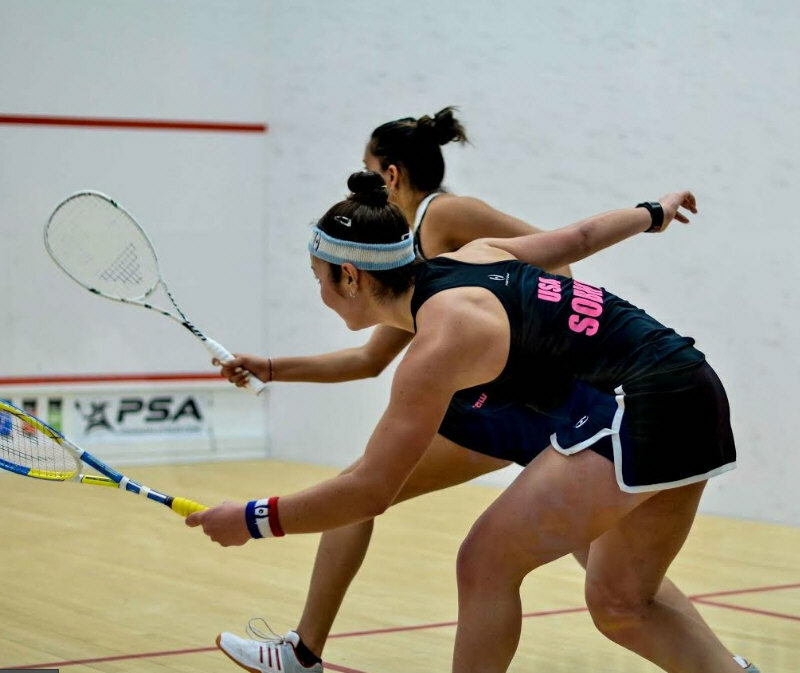 Sobhy, the fourth seed, beat Dipika Pallikal in straight games to set up a meeting with second seed Alison Waters, who ended the run of US qualifier Olivia Blatchford. 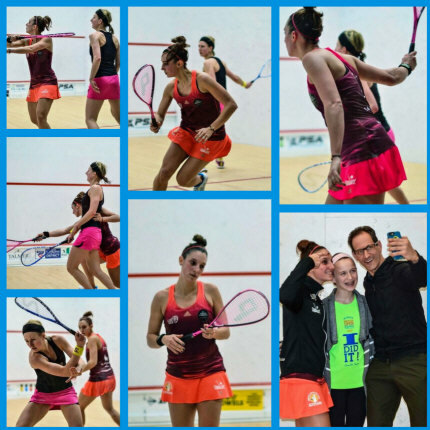 "Game plan was to keep it on her backhand and get good length," said Sobhy, "she is as hard hitter and I had to keep it away from her forehand." "Experience played a big role tonight," admitted Waters, "I didn’t want to drop a game because mentally that would have made Olivia better." 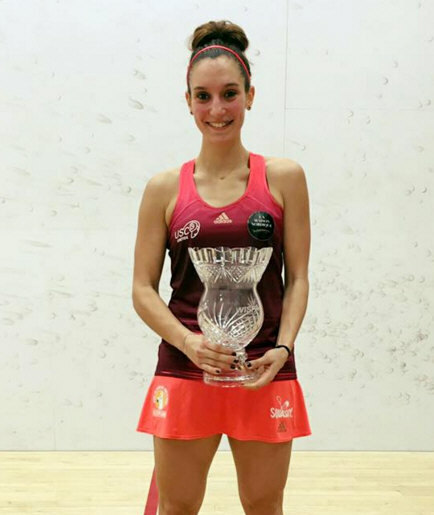 In the top half of the draw top seeded Frenchwoman Camille Serme ended Indian interest as she beat Joshna Chinappa i four games, and she'll meet England's Sarah-Jane Perry, who ousted third seed Annie Au in four games, for a place in the final. 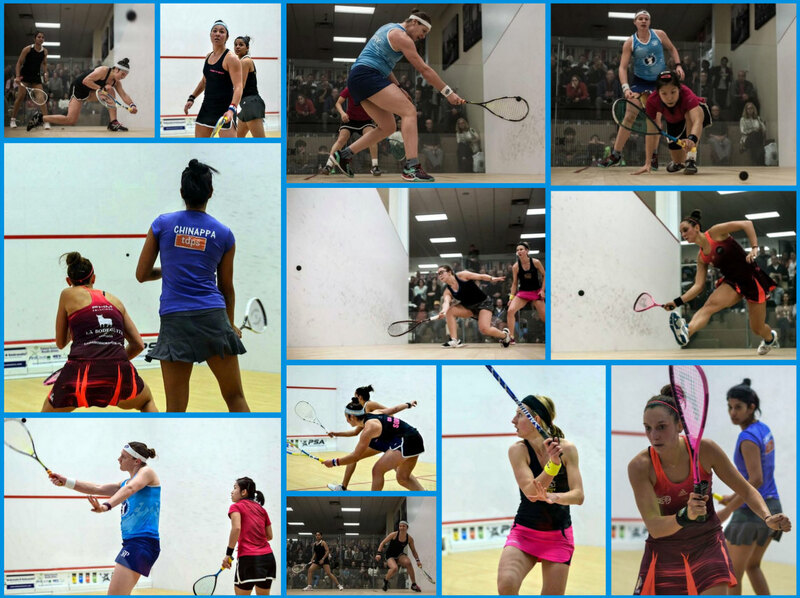 The top six seeds made it through to the quarters in Cleveland, but there were a couple of struggles and a couple of upsets. The top three seeds Camille Serme, Alison Waters and Annie Au won in straight games, but fourth and fifth seeds Amanda Sobhy and Sarah-Jane Perry were taken to five. Joshana Chinappa rounded off the top six with a 3-1 win over local favourite Georgina Stoker, fellow Indian Dipika Pallikal produced the first upset as she beat seventh seed Low wee Wern in four games, and US qualifier Olivia Blatchford stunned eigthe seed Jenny Duncalf, coming back from two games down. 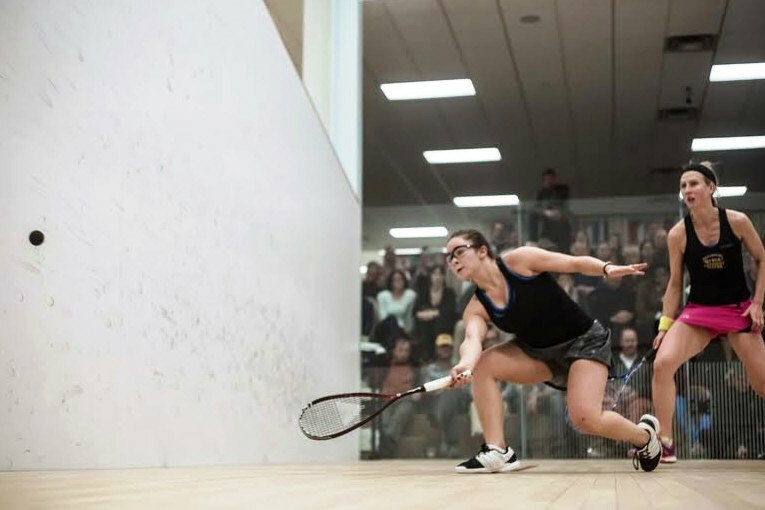 Qualifying finals saw a trio of five-game upsets as Samantha Teran, Olivia Blatchford and Georgina Stoker took out seeded players to reach the main draw of the $50k event in Ohio. Game #1 EL Torky could not settle with the power and speed from Teran. Teran dominated the midcourt and made very few errors (11-3 Teran). Game #2 Second game swung the other way in favor of El Torky who shot and shot and couldn’t miss. Teran tried to play in the long points but the Egyptian brought her in short and hard to kill the rallies (11-5 El Torky). Game#4 Teran kept to her blistering pace and hard hitting, forcing El Torky to make errors early in the game. The length of the third game took its toll on EL Torky who needed till midway through the fourth to steady the ship. A little too late, game Teran (11-9). Game#5 Fitness was the major factor here. Teran was able to maintain a high tempo with hard ground stokes that moved the Egyptian all over the court. EL Torky did her best to shoot herself out of trouble but only succeed in hitting the wrong part of the front wall. Game Teran (11-7). Game#1 Evans dominated the game with very basic strategy taking the ball early to put pressure on Murphy who totally struggled to keep up. Game Evans (11-2). Game#2 Evans started off strong again moving Murphy well around the court. One too many cross courts to the forehand of Murphy landed the Welshman in a lot of trouble. The Kiwi put away every forehand opportunity she was given. Evans held on though to clinch the game (11-9). Game#3 Taking from the 2nd game Murphy forced Evans to the left side of the court where Murphy put in a lot of points from her powerful forehand with straight kills down the wall. Evans shoed enough variation slowing the ball down and boasting sharply against the tall New Zealander who struggled with sudden change of direction. Evans yet again did just enough to hold off the powerful Kiwi. Game Evans (11-9). Game #1 Stoker could not seem to get into the match quickly down 7-1 then 11-3 to Salma. Game #2 More of the same. 4-0 to Salma. A bit of life 5-3. But a run takes it to 9-3, then 11-5 Salma. Game #3 Stoker fighting, but so far Salma drops too good and out to 7-3 lead. Stoker hard work starts to pay off 6-8. 7—9. A good rally 8-9! Error by Selma 9-9. Marvelous kill by Stoker 10-9. Good length 10-10. Great boast winner Stoker up 11-10. Front wall exchange goes to Selma 11-11. Drive kill winner by Stoker then straight kill game to Stoker 13-11. Game #1 Both players come out firing. Good length by both. Good court coverage. Donna using her reach and lob to great effect. Back and forth to 6-6, 8-8 9-9. Great length shot by Olivia 10-9. Boast winner by Donna 10-10. Long rally to Olivia 11-10. 11-11. Missed boast point to Olivia 12-11. Winning forehead drive game to Olivia 13-11. Game #5 Olivia grinds it out to 3-0 lead Donna responds 3-3. Intense points Olivia moves out to 8-4 lead. Donna’s not done back to 7-8. Then a good drop by Olivia 9-7. Bad miss by Donna 10-7. Great retrieving by Olivia she wins final point and match to her 11-7. Murphy’s size and power was too much for the speedy Pacheco. Murphy held the T well, taking the ball very early and thumping it deep for Pacheco to chase. Pacheco was out gunned’ the American struggled to find a suitable game plan and crumbled to the ferocious pressure exerted by the Kiwi. Stoker did just enough to hold off the sharp shooting Brazilian in the match. 1st game was breeze – Stoker took the ball early giving Serfani no time to settle. Serfani went after Stoker in the second game, attacking from all areas of the court into nick (she hit it a lot! ), amazing hands from the Brazilian. Unfortunately Serfani’s aggressive play resulted in a higher error count in Stoker’s favor (15-13) to Stoker. 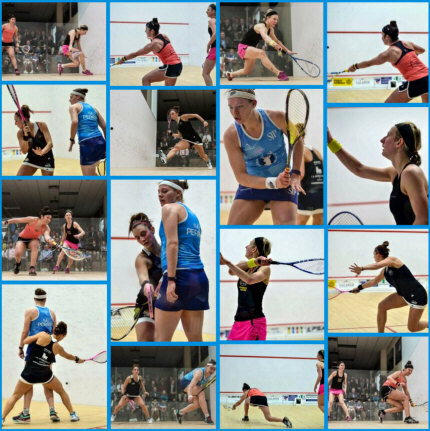 Stoker took a beating in the second game which allowed Serfani to dominate the 3rd through a combination of excellent midcourt attacking play and dying length. Stoker got some rest in that 3rd game and came back stronger in the fourth. Both players exchanged reasonable control of the midcourt, Serfani’s aggressive game again was the difference with too many errors. Blatchford made quick work of the young Sultana – the deal was sealed in less than 20 minutes. Blatchford looked like she was having fun out on the court, very aggressive and physical. The Americans attacking play with hard low shots forced many errors out of Sultana who caught the ball late. Sultana had very little time to react.